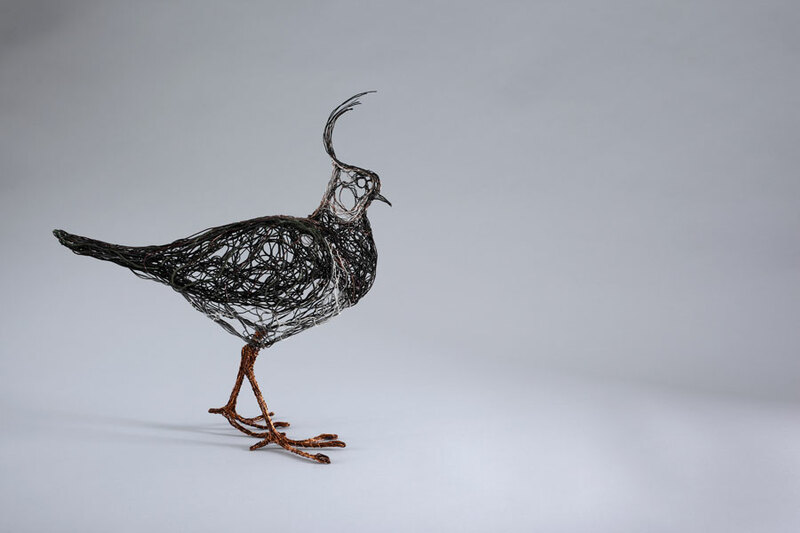 Celia Smith makes wire sculptures of birds. She combines great technical skill with carefully observed naturalistic details to create deceptively simple pieces full of life and energy. 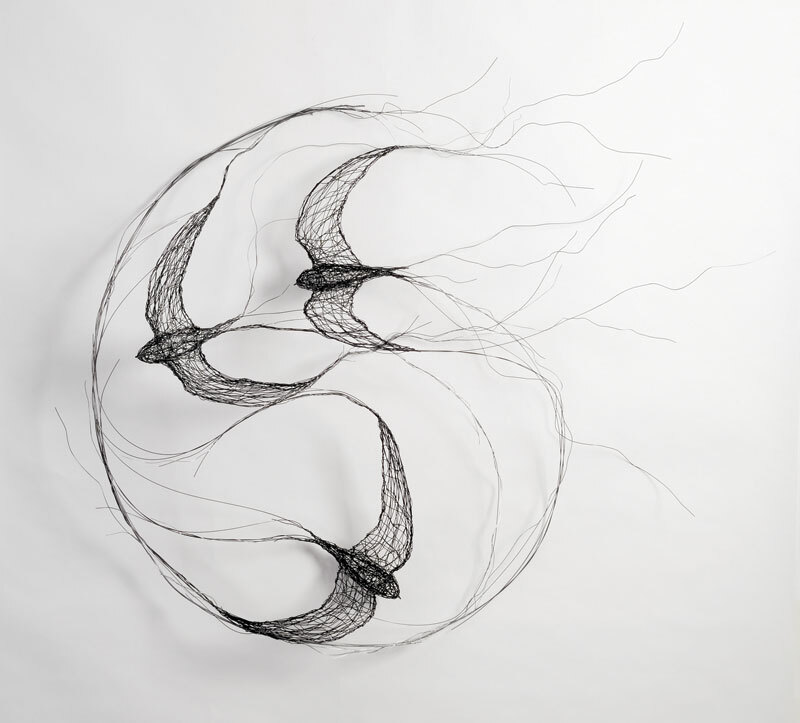 Her sculptures are like three dimensional sketches, where the lines are created by manipulating wire rather than by drawing: they have the same spontaneity and dynamism as a sketch with the added bonus of being in the round. What made you start working with wire? 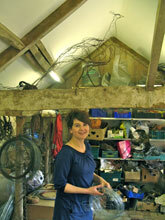 I wanted to work with wire long before I started my degree in sculpture (at Wimbledon School of Art). When I was doing my A levels I was taken to see work by Sophie Ryder who makes big wire sculptures and I was really taken by her work. I lived on a farm so there was always loads of wire lying around and I started to make sculptures with it. When I did my degree I made the use of all the equipment – heavy lifting gear and the like - and materials that were available, but when I finished I went back to live with my parents and went back to basics and wire - it was cheap and easy to get hold of! I never really looked back. What attracts you to wire? Wire is so instant. When I did my degree I experimented with processes like casting but they all take such a long time. Working in wire is like sketching and it’s this immediacy that I really like. Also, I like the fact that you can change it and re-work things in wire. And I think birds and wire go together. 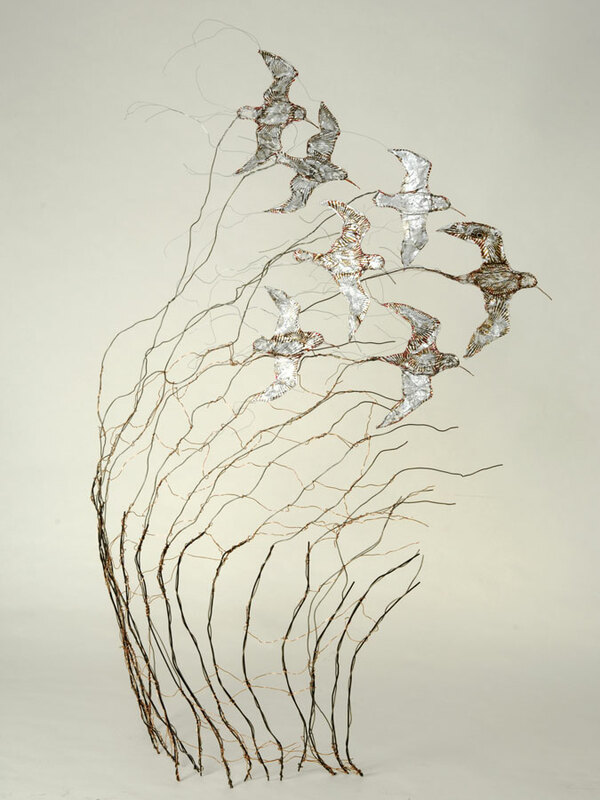 The wire gives the sculptures a sense of lightness and movement that you wouldn’t get if you used other materials. Do you find wire lacks variety and colour as a material? No, not all. I have never been very comfortable with colour – I’m quite a monochrome person. And in fact there is a lot of variety within the wire I use. I source it from scrap yards where you can find all sorts of different wires from coloured, plastic coated wire to rusty, quite weathered wires. I like working with wire that’s weathered as it’s often got interesting patinations and colours. All wires are different and all make different types of lines to use and draw with. How important is the re-cycling element to your work? I have always been a bit of a hoarder and it’s very satisfying to re-use old materials, but I know that in fact most of the wire goes to China to be re-cycled and so I’m just intercepting it before it goes abroad. 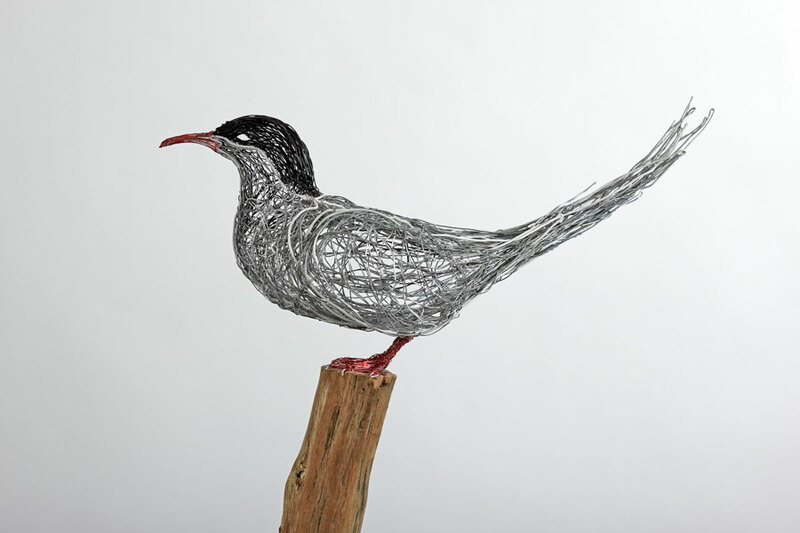 Sometimes I manage to re-cycle materials in quite a neat way; when I was in Shetland I made a flock of geese out of wire I sourced there and I also made a piece out of the foil wrappers from all the tea cakes I ate there when trying to keep warm while studying the birds. Have you experimented with any other materials? I have tried working with sheet metal, but haven’t really stuck with anything. I’ve also experimented with clay and willow but I always seem to come back to wire. Have you always been more attracted to sculpture than flat art? I have always been interested in working three dimensionally. I was taught art in quite a conventional way at school and even when we were doing basic oil painting I was always trying to build something coming out of the picture. As I child I was always making models. And yet drawing seems to be an important part of your practice? Although I have always been interested in working in 3D, I enjoy sketching and life drawing. And now sketching is becoming a bigger part of my work as I am doing a lot more wall mounted pieces which are closer to wire drawings than sculptures. The way I draw is changing too – I’ve become a lot freer, more gestural and more confident in my drawings. When I first started it was hard to get anything recognisable down on the paper and now a few marks can mean something. How does your sketching feed into your sculptures? I always have a sketch book on the go and when I visit a reserve to study a particular bird, I make a series of sketches (although I will also do little wire studies) which I then build up in the studio to make a life-size piece. I don’t really like using photographs as I find the results too staid and too detailed – they’re quite frustrating. I find I get to understand how a bird moves and flies much better if I study it for several hours and try and capture it on paper. All birds have different characters – some are more twitchy than others – and you need to look at them closely to get their character. What first attracted you to birds as a subject matter? I started off making sculptures of domestic birds I saw at home on the farm. Then I spent a year in New Zealand and started looking more closely at birds like oyster catchers that I saw on the beach and when I came home I realised that there were equally interesting birds here. Birds keep on inspiring me – the more I go out and draw them, the more I see and the more ideas I get. Have you any long term plans for the future? I sometimes wish that I could do a print making MA one day. I’ve always been intrigued by printing and have experimented with printing with wire in the past – I feel there is something there that I want to investigate.